A fantastically capable sound design synth for Max For Live users, but it comes at a price in terms of system resource usage. Huge sound-shaping potential. Relatively intuitive interface. Unique Generator duplication. Decent array of factory presets. Capable of unique and complex sounds. Very CPU-hungry. Pricey for a Max For Live device. 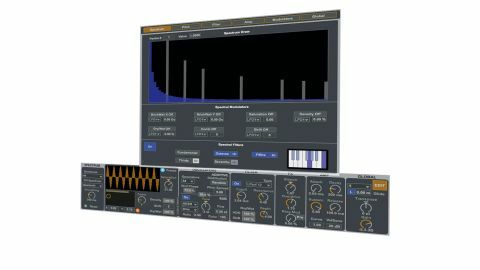 Dark Synth is a new Max For Live device developed by Amazing Noises and distributed by Ableton. It brings the often overlooked technology of additive synthesis to Live 9, and packs a hefty punch doing it, allowing up to 2048 partials to be stacked up, either arranged in a pre-defined waveshape via the Fill Spectrum dropdown or drawn freehand in the pop-out Edit window. "Dark Synth can effectively create sounds involving up to 262,144 sine waves"
This sound engine is then duplicated to create up to 128 identical Generators that can be detuned and phase-shifted. What this ultimately means is that Dark Synth can effectively create sounds involving up to 262,144 sine waves. It also features a Brickwall Filter (a DJ mixer-style combination high-/low-pass that operates directly on the partials) with an X/Y pad and a Spectral Comb Filter, as well as an analogue- style sub-oscillator offering a selection of classic waveshapes, which can be separately tuned and blended with the main synth. Global pitch/amp envelopes are controlled in the Edit window, while the FX section offers Overdrive and Ring Modulation, plus a Stretch control that can introduce inharmonic (or 'non- musical') partials into the sound. There's also a multimode filter with its own envelope shaper, a pair of modulation envelopes and two LFOs. "It excels at the creation of rich, highly textural and 'unique' sounds"
All of this comes together to make Dark Synth a hugely powerful sound creation tool. Being an additive instrument, it excels at the creation of rich, highly textural and 'unique' sounds, and thus makes a great addition to Live's instrument arsenal, offering deep, experimental sound design capabilities that go beyond anything included with the DAW. The interface and controls are well laid out, too, making the inherently complex and daunting processes at work under the hood feel relatively intuitive. Perhaps more so than other types of synth plugin, additives can live and die on the strength of their included presets. While, in an ideal world, we'd obviously all like to be creating our own custom synth sounds from scratch every time, the fundamentally laborious and time consuming nature of additive synthesis (even within Dark Synth's comparatively succinct interface) means that, for most producers, a decent stock of usable and well thought-out jumping off points is something of a necessity. Dark Synth performs well on this front, including around 150 factory sounds that do a good job of showing off its broad potential. Included are rich bass tones, evolving pad sounds and plenty of atonal and experimental textures, all of which can easily be tweaked, modulated and manipulated to form useful foundations for developing your own sounds. There is one, fairly substantial, downside to Dark Synth, however. In our tests, the device proved to be extremely CPU-hungry, meaning that running more than one instance of it (or loading it up in a project already containing any other demanding plugin) was essentially a no-no, even on our relatively powerful test Mac (a 2.5GHz i5 Mac mini with 8GB RAM). That aside, though, it's an amazing synth, and creatively minded Live users should certainly check it out - just be aware of its processor- sapping tendencies, and remember that Live's Freeze function is only a click away.